In the following guide you will learn how to integrate SS10680Modbus/MQTT IoT Gateway with Ubidots IoT Application Development Platfrom. 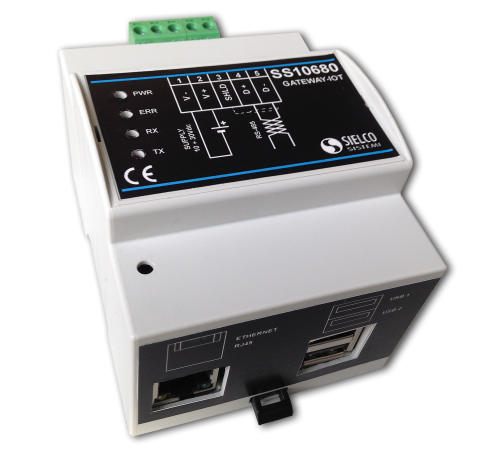 Designed by Sielco Sistemi, this industrial gateway is specifically designed for data collection systems, and optimized for the Internet of Things (IoT) applications. Thanks to our friends at SIELCO Sistemi for testing and putting together this guide! The SS10680 supports bidirectional communication between field equipment and the Cloud easily, and provides a Modbus RTU master interface on RS485 or Modbus TCP over Ethernet to communicate with devices in the field. The variables read by the Modbus slave devices are then sent to the Cloud via the MQTT protocol with TLS client certificate authentication on variation or fixed time. Finally, the configuration of the gateway is carried out via Web pages and can perform updates over-the-air when required. For additional details about your SS10680 Gateway's configuration and connection please refer to the Datasheet and User Guide. One thing we like most about this hardware series is the ability to configure the device parameters (MQTT, Ethernet, Modbus, ...) via a simple web page. To access the web page it is necessary to type in the address bar of your browser the device's IP address (default: 192.168.1.100). Make sure that the IP address of the device belongs to the same subnet as the PC in use. To know if your computer and the hardware are on the same subnet you need only run the command below in your computer's terminal. If you do not know the IP address of the device, refer to the Recovery section of the User Guide above. Configure the MQTT protocol in order to connect to Ubidots service; and enter your Ubidots TOKEN as the Username. Use Payload editor to select MQTT message structure. Once your SS10680 Modbus/MQTT IoT Gateway is configured, you are already able to visualize your data in Ubidots and complete your application's development and overall system functionality. Go to your Ubidots account and verify the data has been received. Remember that in Ubidots, the first time data is sent to the cloud with your Token, a new device is automatically generated. If the above configuration has been completed correctly, you will see a new device automatically created in the Device section with the device name of your SS10680 IoT Gateway. Now its time to create Ubidots Dashboards, Events, and more to enable your data to make better decisions, simply and coherently. In just a few minutes you have integrated the SS10680 IoT Gateway with Ubidots, sent some sample data, and recorded your work in Ubidots where the data is stored, visualized, and analyzed to drive decision and processes.